As the floodwaters receded from Hurricane Irma, the cleanup work around Miami began. Although municipal work crews were already hard at work with the cleanup efforts there is just so much they can do with the manpower at hand. They are already letting homeowners know that it could be weeks until all the fallen trees around the area are chopped up and removed. 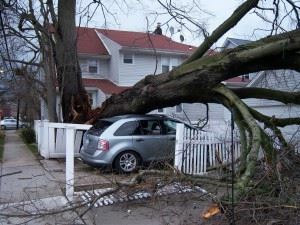 That is certainly a major headache especially if one of those trees is blocking the driveway or street. As for all the soaked furniture and other household items damaged in the storm in may be up to individual homeowners to take care that. Thankfully, you can always count reliable hurricane cleanup with Junk King Miami. Junk King Miami crews were working hard before the storm to help homeowners clear way any debris that could have been potential hazard. Now the crews are back at it cleaning up all kinds of water soaked debris from homes and businesses. If you hire Junk King Miami, you’re hiring your own work crew. If you still have items in your house that need to be pulled out before mold starts to grow, then you can count on the Junk King Miami team to take care of that. In fact, it might be better to let them handle that job than to put your back at risk. You have at least two workers at your disposal for the duration of your hurricane cleanup session. You’ll find of these workers move very fast. They know important time is and how eager you are to get this hurricane cleanup completed so that you can get back to normal. Before the storm, Junk King Miami was completing the majority of clean up sessions within 24 hours. There might be a slight delay given the viable work that they are taking on. However, if you call in your home is in the same vicinity as a truck you could still score a same day pickup appointment. As for pricing, that hasn’t changed. Junk King Miami still charges a price based on volume and not weight. That will make a huge difference especially with something that is so down with water. As they have in the past, Miami will get through this disaster. You can always count on Junk King Miami to lend a hand with your hurricane cleanup. This entry was posted in Miami Junk Removal and tagged hurricane removal, junk king, storm on September 26, 2017 by Junk King. Last updated September 26, 2017 .